While not unexpected, the economic crisis and the financial industry are back in the news as the LIBOR scandal. It seems that only the “tip of the iceberg” has been revealed about a severely misguided global economic system and the business leaders, philosophies, strategies and practices that created it continue to keep it operating. My hunch is that, years from now, we will find that the tentacles of this inequitable and scandalous financial system reach into all aspects of local and global life. This past week, our Rethinking Complexity posts focused on an exploration of systems thinking and mindful leadership with integrity. These discussions can provide a dynamic avenue for how to assess the current economic and organizational practices as well as the decisions that business professionals are making. So let’s continue the conversation about systems and leadership by applying insights to organizational and professional ethics. Ethical thinking is more than just seeking the (common) good, determining what is right, following the law, or being consistent with social and business norms. Central is a critical reflection process that is rooted in thoughtful inquiry, open-minded dialogue and honest discernment. With this process in mind, ethical perspectives and values can serve to foster deep examination of situations, problems, and issues as well as the ramifications of the proposed solutions. They can be woven into a systemic, analytical lens that raises questions for individuals and organizations to ponder and create scenarios for them to critically explore. In this manner, the complex nature of the situation and the long-term effects of its solutions are brought to light. Previous posts have proposed respecting human dignity, being equitable and seeking the well-being of stakeholders as cornerstone values for ethical organizations and leaders with integrity. These values can be developed into an eight-tier analytical-lens ethical system. Such a perspective does not state what to do, but helps raise critical questions. It strives to create truthful inquiry, open dialogue with others, and encourage collaborative examination and discovery, risk taking, honest discernment, and courageous action. The eight-value ethical system presented below can enable organizations and managers to assess if the decision to be made and the action to be taken not only respects human rights, but promotes the appropriate use of power and builds community and vital relationships for the advancement of the common good. 1. Enhances Human Dignity: Do business and workplace practices dehumanize (or exploit) workers, customers, business partners, vendors, or civic communities? Is the quality of life actually or potentially diminished by business goals, policies, and partnerships, managerial practices, marketing strategies, organizational operational procedures, and financial management practices? 2. Fosters Health and Well-being: Do business and workplace practices impair—physically or emotionally—the well-being or livelihood of workers (and their families), the members of civic communities, or societies at large? Do they lower organizational morale, create anger towards the organization or colleagues, or diminish the organization’s spirit or community networking? Do they damage the vitality of local or global community in which the organization functions? Do they harm or leave a destructive legacy for future generations? 3. Safeguards Human Rights: Will any commonly recognized human rights be lost or violated by the enactment of the organizations business or workplace strategies, practices, and policies? Do they exploit the generosity, needs or fears of employees or the communities in which they functions? 4. Promotes Appropriate Use of Power: Will any individual or group potentially be disenfranchised or discriminated against due to the implementation of the organization’s business or workplace strategies, practices, and policies? Does the organization and management inappropriately intrude into the employee’s home life and non-work time, or into the community and its affairs, governance? 5. Maintains a Sense of Balance Between Individual and Collective Interests and Responsibilities: Do both the individual and the community—internal and external to the organization—benefit from the decision and action? Are responsibilities to both met? 6. Fosters the Development of Life-Enhancing Relationships: Are vital personal, professional, organizational, social, and global community networks, bonds between people, and relationships createdor maintained by the decision or action? Are they and essential environmental relationships harmed or severely disrupted by the decision or action? 7. Builds Community: Does the organizational or managerial decision and resulting action bring the workplace and organizational system into a more communal way of being and operating or does it isolate and create fragmentation? To what degree does it foster interdependence? Does it strengthen needed interdependent relationships with local and global communities in which the organization exists, or does it harm them by creating destructive independence, dominance and separation? 8. Uses Resources in an Equitable Manner: Are any individuals or groups—organizational, civic or global—disadvantaged or deprived of needed resources by the decision or the policies that stem from it? Does the decision promote a sense of just and equitable use of resources so all can flourish? Human dignity does not end with rights, but often leads to a sense of interconnection and concern. It can eventually result in a focus on empathy and care. As an organizational ethical lens, this eight-value ethical perspective calls business enterprises and their leaders and managers to act in a responsible and emotionally intelligent manner that benefits not only themselves but all stakeholders. 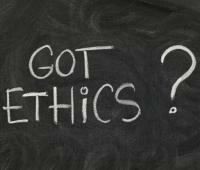 Now, what is your ethical decision making system?